1. THEIR NICKNAME ISN'T AS CRUEL AS IT SOUNDS. Belugas are sometimes referred to as “melonheads,” and while that sounds like a name thought up by a middle school bully, it actually has some scientific basis. The bulbous structure that occupies the whale’s forehead is indeed called a melon, and it can be found in all species of toothed whales. The fatty organ is believed to aid in echolocation (a process in which animals use echoes of their calls to locate and identify objects), and it can be observed changing shape during whale vocalizations. 2. THEY ARE EXTREMELY VOCAL. Another, much nicer-sounding nickname belugas have earned for themselves is “sea canary.” The name comes from the animal’s rich and varied vocal range, which is sometimes loud enough to reach through the hulls of ships. Scientists have documented at least 11 distinct beluga whale sounds, including high-pitched whistles, clicks, mews, bleats, chirps, and bell-like tones. The noises are used for echolocation when navigating dark, arctic waters, and experts believe they also function as a form of communication between whales. Mothers and calves exchange calls that can be compared to the sound of a finger running along a plastic comb. 3. THEY CAN EVEN MIMIC HUMAN SPEECH. 4. THEY ALSO USE BUBBLES TO COMMUNICATE. In addition to being master vocalists, belugas are also experts when it comes to bubble-blowing. 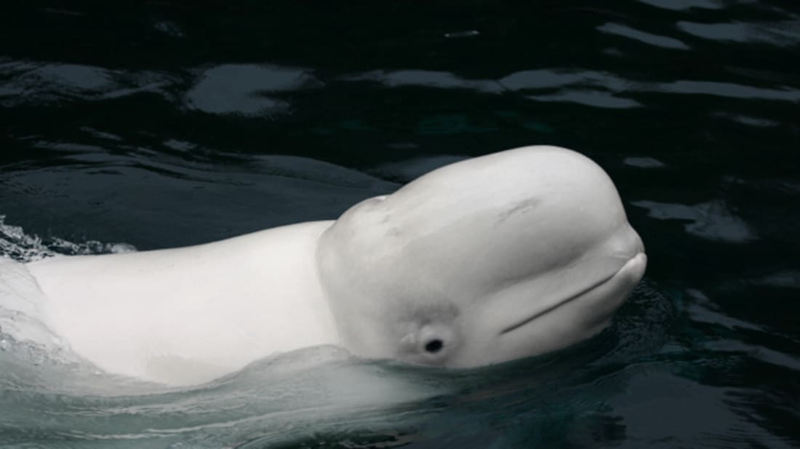 A recent study of 44 captive beluga whales showed that this behavior is more than just a source of amusement for them. While rings and bubbles slowly released from the blowhole are believed to be a sign of playfulness, other bubble types are suspected to serve more functional purposes. Sudden bubble bursts can indicate a defensive reaction, while matching bubble rings blown by a pair of whales is connected to social bonding behaviors. 5. THEIR UNIQUE COLOR HELPS THEM SURVIVE. The word beluga is derived from the Russian term for white, bielo. The mostly pure white shade of adults (calves are dark gray) is arguably the whale’s most distinctive feature, but it’s meant to help them blend in, not stand out. As they swim among the polar ice caps, their pigmentation is thought to act as camouflage to protect them from predators like polar bears and orca whales. 6. THEIR NECKS ARE UNUSUALLY FLEXIBLE. Unlike most whales and dolphins, the seven neck vertebrae of the beluga whale are not fused together. This allows the creature the freedom to turn its head side-to-side and nod up and down. The adaptation is thought to help them better target their prey in areas that are full of ice or silt. 7. THEY CAN SWIM BACKWARDS. Belugas possess another ability that is quite unusual among cetaceans: They can swim backwards. Their impressive maneuverability skills make up for their sluggish speeds of two to five miles per hour. 8. THERE’S A REASON THEY LACK A DORSAL FIN. Many whales can be easily spotted when their dorsal fins break through the water’s surface, but this feature is absent from the backs of belugas. The reduction of surface area helps prevent heat loss in the frigid Arctic Ocean, and it also makes it easier for them to glide directly beneath sheets of ice. They do, however, have a sturdy dorsal ridge along their backs that helps them break up ice layers. 9. THEY’RE CLOSE COUSINS WITH NARWHALS. The beluga is closely related to another unusual species of arctic-dwelling whale—the narwhal. The two medium toothed whales are the sole members of the Monodontidae family. 10. THEY PACK PLENTY OF BLUBBER. Beluga whales have adapted to their arctic habitat by developing an especially thick layer of insulation. Blubber alone accounts for more than 40 percent of the whale’s body weight.